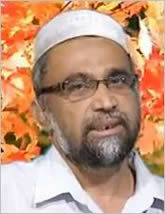 Usthaz M.A.M.Mansoor a well-known Islamic scholar & intellectual was born in 01st July 1958 in Akurana, Sri Lanka. He graduated from the Ja’miah Naleemiah in 1981 and joined Ja’miah Naleemiah as a lecturer in the same year. Subsequently, he also completed his Bachelor of Arts (BA) degree at the University of Peradeniya in 1981. He served as a lecturer for nearly 22 years between 1981 and 2002. He has been active in the field of Da’wah since 1978 to date. He committed his entire life to Da’wah being a full time Islamic Activist since 2002. He is an expert in “Thafseer” nevertheless a generally specialised scholar, a respected think-tank specialised in minority Da’wah. He’s also a well-versed in the middle eastern politics, particularly the Arab spring. Presently, he is the Founder President of “Mishkath Institute for Islamic Research (MIIR)” and “Al Quran Open College (AOC)”. These two organisations work primarily towards a practical and intellectual change in the life of Sri Lankan Muslims. He is one of founders of the leading Islamic newspapers “Meelparvai” in 1995. He is also the Chief Editor of “Naharvu”, a revolutionary magazine published by MIIR. He serves as an Advisor & Shari’ah Counselor for many Zakah Committees, Islamic Institutions, organizations and other Islamic bodies’ island wide. Usthaz Mansoor conducts weekly lectures on every Friday in Akuruna (this program is live streamed via usthazmansoor.com & slmuslims.com) on various topics. In addition, he conducts Islamic classes & Thafseer Lessons in many places in the island. More details of his regular programmes are published in usthazmansoor.com & slmuslims.com. Sheikh Usthaz M.A.M.Mansoor has published many books; Thafseer Soora Fathiha & Kahf, Ethnic Conflict: Islamic Perspective, Holy Quran in a Ajami's View, Aim and Practical Aspects of Fasting, Remembrance (of God), Learning Quran - Few Guidelines, Prophet and Education, Islamic Ruling of Marriage are to name a few that have been popular among the readers of his literature.